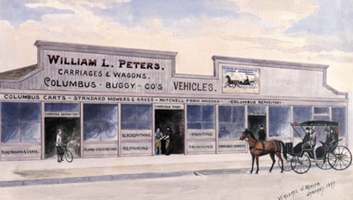 William L. Peters was born in Columbus, Ohio in 1864. He graduated from Ohio State University with a degree in mechanical engineering. Arriving in Riverside, he set up a carriage selling business, and later entered into real estate development with S. C. Evans, Riverside’s first mayor. He was instrumental in Riverside’s first electric light plant at the turn of the century and served for many years on the board of public utilities. He succeeded S.C. Evans as mayor of Riverside in 1912 and served until 1914. One of his major accomplishments as mayor in his one term of office was to acquire Riverside’s present municipal water system.